The familiar coastal landscapes of the Northern Beaches have developed quite recently in geological time. The earlier coastline during the last glaciation was about 20 kilometres to the east. Today’s familiar beaches and estuaries developed as a result of sea level rise as the ice age ended, about 10 000 years ago. The sea reached its present level about 6000 years ago. Many beaches along the NSW coast are (or were) backed by dunes with a wetland, lagoon or creek behind the dunes, into which the hinterland drains. Typically the lagoon opens periodically to the ocean. The opening generally is where dunes are lowest, at the north end of the ocean beach. Southerly ocean currents and winds carry sand northwards until blocked by a rocky headland. Narrabeen Lagoon and beach is a typical example. ICOLL is the acronym geologists give to this landscape feature – intermittently closed and open lake or lagoon. Avalon Beach and Careel Creek, before European settlement, would have been a similar landscape formation. However, the catchment of Careel Creek is much smaller than that of many along the coast, bounded by the ridges of Avalon Golf Course, Bilgola Plateau, the rise towards Clareville, Stapleton Park and the slopes near Kevin Ave and George St. The creek behind the dunes was quite wide and shallow and would have retained water much like a coastal lagoon particularly after heavy rainfall events. But perhaps there never was enough water flowing down the creek to force its way through dunes. Also, the lie of the land is lower towards Pittwater so the creek flows into the receiving waters of Careel Bay. In the early days of settlement, about 1840-1880, the Collins family had a dairy farm at Careel Bay. It occupied most of North Avalon. They leased the land from Father Therry. The creek was dammed just south of the present North Avalon Rd to ensure a supply of freshwater. It had an earth wall, with a spillway on the western side. Below the dam Barrenjoey Rd crossed the creek. A 1930 aerial photo indicates the dam was well and truly gone but had left a strange “kink” in the creek. In the 1940s Bill McDonald, a prominent citizen of early Avalon, was able to paddle his surf ski up to the shops, when the tide was high and especially after a heavy downpour. This would have been before the creek behind the dunes was turned into an open concrete drain. Careel Creek – or Avalon Main Drain? The catchment of the creek has been progressively urbanised. With settlement come increased and sudden flows of stormwater off the hard surfaces of roads and roofs. Avalon shopping centre is almost at sea level. Flooding has been a problem, particularly when heavy rain coincides with high tides. One early solution to this was to turn the upper section of Careel Creek into a concreted open drain, in the hope of speeding the flow of stormwater which would have been impeded by the wetland and vegetation downstream. Pittwater Council staff believe the concrete drain was installed when Barrenjoey Rd was widened in the 1960s. Above: Planting near the creek at Etival St.
Another effect of urban development has been a deterioration in water quality in the creek. Wetlands are natural filters for organic and mineral sediments and plant nutrients such as phosphorus. The concrete drain allows any pollutants in the catchment wash straight down the creek. A Gross Pollutant Trap near the eastern end of Central Rd catches large items such as plastic bottles and other rubbish, also larger organic material such as leaves. However water quality is not suitable for swimming. Dredging to reduce flooding and smells is not an option because of the presence of acid sulfate soils. Like sleeping dogs, these must be let lie. Acid Sulfate Soils occur naturally in both coastal (tidal) and inland or upland (freshwater) settings. Left undisturbed, these soils are harmless, but when excavated or drained, the sulfides within the soil react with the oxygen in the air, forming sulfuric acid. This acid, together with associated toxic elements (heavy metals and other contaminants), can kill plants and animals, contaminate drinking water and food such as oysters, and corrode concrete and steel. This would be a disaster for Careel Bay. These areas offer valuable habitat to wildlife, all the more so if they are connected. 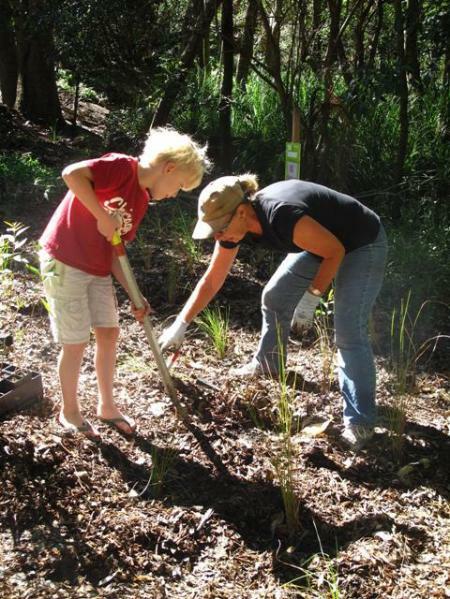 Avalon Dunes was once infested with Bitou Bush, the creek’s banks with various woody weeds and Careel Bay’s saltmarsh areas were under attack from Asparagus Fern and other weeds. Since 1990 ongoing bush regeneration projects have enabled local native vegetation to replace the weeds and recreate valuable fauna habitat. 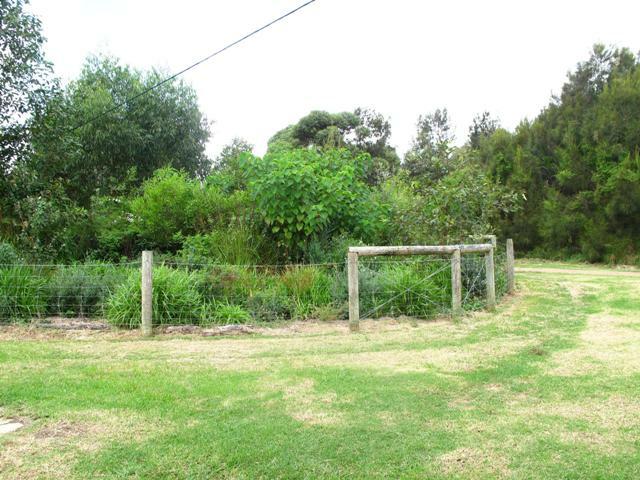 To provide this link to Careel Bay, Careel Creek’s banks are being progressively revegetated with local native plants. Current revegetation work (2012) along the section from the sewer pumping station to North Avalon Rd is being funded by a Community Action grant to Pittwater Natural Heritage Association, in partnership with Pittwater Council. The grant is from the Federal Government via Hawkesbury Nepean Catchment Authority. 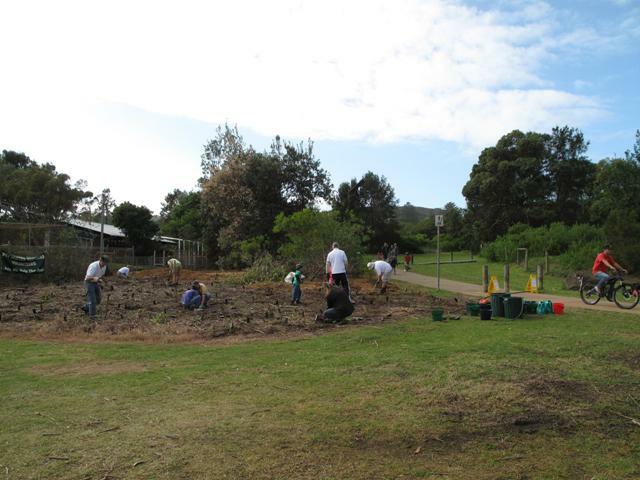 Students from Barrenjoey High School, Avalon Public School and community volunteers have helped with planting tubestock here. Trees & shrubs are growing fast. Swamp Mahogany (Eucalyptus robusta) will provide winter food for honeyeaters and lorikeets. Birds often seen along the creek include: Pacific Black Ducks, Australian White Ibis, Little Pied Cormorant, White-faced Heron. Unfortunately many of the ducklings are eaten by large eels. As native plants grow small birds such as Superb Wren, Spotted Pardalote and White-browed Scrub Wren will forage for insects there. Watch for the mud nests of Magpie Larks in the trees on the western bank. 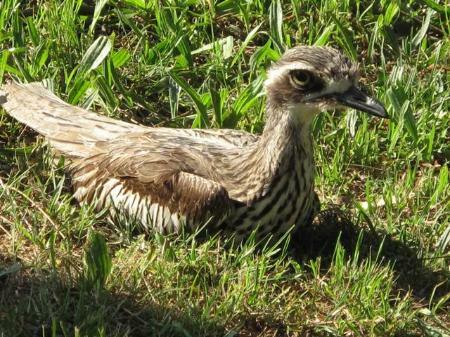 The Bush Stone-curlew is an endangered species in the Sydney area, but breeds in Careel Bay. During 2011 one was often seen along the creek or nearby. This bird needs open woodland or saltmarsh, with fallen branches to hide among, as it relies on camouflage to protect itself and its nest on the ground. Schools of small fish, perhaps mullet, come upstream to the start of the concrete. The highest tides push upstream to about this point. So despite the poor water quality from a human perspective, at least some fauna find it acceptable. 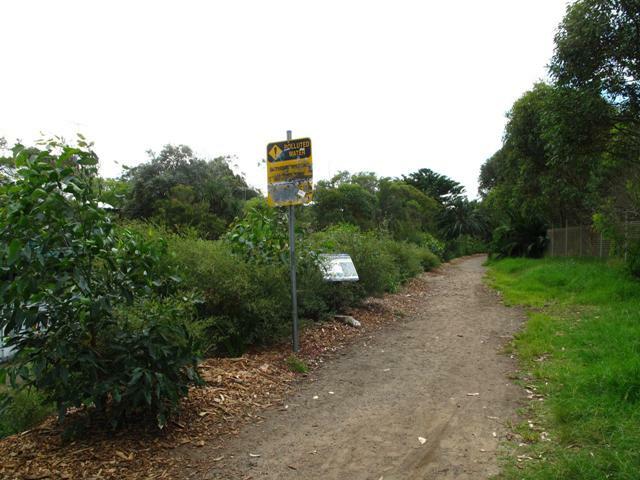 The walking track from Avalon to North Avalon, the “Yellow Brick Road”, swings eastwards around the dunes before the sewer pumping station. But an informal track continues along the east bank of the creek. By a quirk of past subdivision, the rear boundaries of some Elaine Ave properties adjoin the western high school boundary in midstream. So this track is actually on school property. Unfortunately much of the western creek bank here is private property and very weedy. We can but hope for future improvements. Above: Stone Curlew, October 2011. Compiled by Marita Macrae, Geoff Searl and Paul Hardie.